A unique electric motorcycle concept has been created using state-of-the-art technology which takes the form of the two-seater Essence E-Raw electric motorcycle. The Essence E-Raw was first unveiled a few years back but has since been improved and refined, yet still sports the signature laminated wood seat. 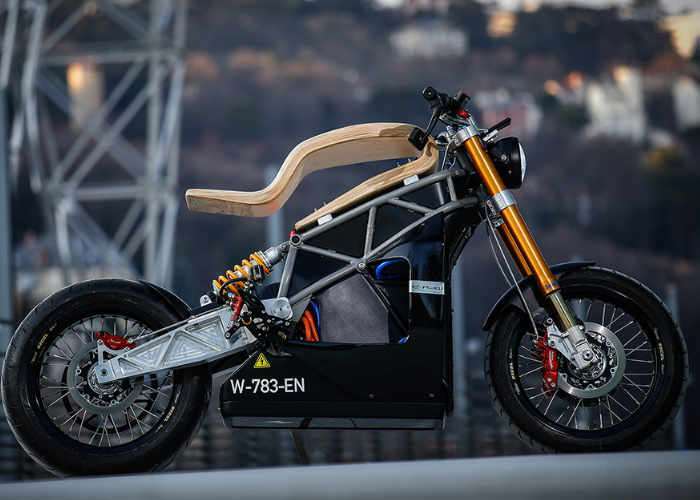 The electric engine provides over 100hp capable of propelling the 370-pound bike from 0-62 in just 3.5 seconds and is powered by a battery with a range of over 100 miles. The E-RAW concept was born in a universe where the charming sounds and intoxicating perfumes of the combustion engine have given way to the fusional silence and the transcendental fluidity of electric propulsion, a universe between Heaven and Earth, at the intersection of that Aviation and the motorcycle. The electric propulsion allows to simplify the powertrain part. Similarly, we have simplified the cycle part, based on a fundamental mechanics. In order to change paradigm, we have returned to the starting point, the essence of the bike, to take a new direction. Linking tradition and innovation, the aesthetics of the e-raw concept brings the language of the electric and the lines of the past closer together. Authenticity is another value on which the new paradigm is built. It is in this spirit that we like to work, both in conception and in realization. We combine raw materials, metal and wood, which we work by hand, using artisan techniques as ancestral as innovating. Jump over to the official Essence E-Raw website via the link below for more details and full specifications.